Ever since the inception of Bangladesh in 1971 its politics have been featured by several types of seemingly endemic conflict, some of which have been associated with either periodic outbursts of violence or prolonged relatively low-key armed confrontations. To a study of conflict in Bangladesh the experiences outlined above are, no doubt, of fundamental relevance. The external influences, corruption and inefficiency widely believed to be associated with the activities of government emergence of the type of political unrest which finds expression in violent conflict. Currently, the political situation in Bangladesh refers to an ‘abnormal crisis’. The form of crisis consists of mayhem, destruction and violence through hartal, riot, and political dichotomy leads country to muggy, uncertain future. When the government has taken steps to control the situation towards arresting the opposition leaders incriminated in the involvement of violence that has created new phase of dispute and confrontation between the government and opposition party. Debate continues, however, as to what and how democracy remains without violence. Democracy is a continuous political process, which can only be sustained and developed by giving due attention to certain issues. The observations range from a political system based on government legitimacy in which the power of government is limited and the government is accountable to its citizens. The system is featured by the existence of competitive political parties in which the majority respects the rights of people’s opinion and there are institutions which limit the power of the government and ensure its accountability. Most of the scholars are agreed that Bangladesh take just theoretical concept of democracy. To hold arbitrary form of power the political party uses necessary undemocratic practices. While they employ law and order agency as to repress opposition’s protests that escalate violence abruptly. At present time, Bangladesh is facing different crisis in their internal politics which creates a big casualty in the state system. But we all believe that it is possible to live in peaceful coexistence in Bangladesh by the good initiative of two political parties of Awami League and BNP. The pioneering party Bangladesh Awami League omitted parliamentary democracy, brought changes to the Constitution, and the party itself became an autocratic organization. So this upheaval and unrealistic thinking creates a conflicting environment in the political atmosphere of Bangladesh. The attempted solution of the political crisis in Bangladesh is ending at a point, which most of the people didn’t expect. A frustration is inflicted on them with the unexpected developments of the events. 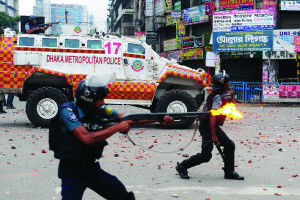 But time demands peaceful solution of this unexpected political violence in the Bangladesh. So this is very crucial for present political turmoil in Bangladesh which should be changed in a positive way and make a transition with peace. There are diverse processes to get rid of this violent conflict in Bangladesh. This is very imperative issue for Bangladesh’s political parties; they will have to find political solutions by themselves instead of looking for outside help in holding free and fair elections to continue as a thriving democracy. To foster the democratic process, free and fair elections and all parties participation in the upcoming election is more important than the violent conflict within the state. If the present government failed to mitigate the present political crisis in the country, it will be vast impact on the state mechanisms as like internal and international politics, economic and social security of the practical field. The autocratic decision of ruling party Bangladesh Awami League (BAL), thought about interim government and its head will be present Prime Minister Sheikh Hasina, can create more political turmoil in the country. The opposition party of Jamaat and BNP won’t accept Hasina as interim government head, they want caretaker government and election within ninety days after the present government times. So this kind of disputing decision falls down the country in the hell for their future generation. Make a phone call from both sides for specifying date, time , place, participants etc. invitation should clearly state that dialogue will be held between two alliance. A separate letter should be issued to all other political parties (Jamaat, Jatio Party, Communist Party and others). At the same time a letter detailing all above mentioned items should be sent under the leadership of Secretary General and standing committee members. Dialogue may be held at Bangabhaban, Special meeting room of the parliament, Sonargoan, Raddison, Westine (but not in Ganabhaban). Since there are too parties it must be moderated by the President or speaker. If BNP has the courage to agree with an all party government without Hasina they can also invite selective civil society members. The ongoing political crisis over the polls-time government can be solved by amending the constitution. Because present AL government created this crisis by amending the constitution within a few minutes, so it can be solved by amending again. If the govt. will arrange election alone, the major political groups Jamaat and BNP will not allow the government to hold a one-sided election keeping their out of the race. Most of the time opposition party boycotts the assembly because the assembly has turned into a one-party assembly. So, it is impossible for them to join the Parliament session for the amendment of constitution. At this eleventh hour of the time, constitution amendment can be good initiative by government or they can take referendum for the upcoming election process, if it is needed.